Abdul Rahman al-Rashed, head of Saudi-owned Alarabiya television news network, today faults a prominent Syrian activist for joining international mediator Kofi Annan in warning that failure of the political process in Syria could lead to a civil war that won’t affect only Syria but the whole region. We know Annan was nominated to head the Syria mission by the Syrian regime’s backers – namely, the Russians and the Arab League secretary-general. This explains why his report was conciliatory to the regime and its allies. The same cannot be said of Kilo, the man of mettle hailing from Latakia who spent years behind bars for opposing the regime and holding to his political convictions. But I certainly dispute his setting a ceiling of two options -- the regime or war. I think if you asked the Syrians today, the regime’s downfall is their only preference, irrespective of the timeline and suffering involved. To suggest Syria is suffering the consequences of a struggle between Saudi Arabia, Qatar and Turkey on one hand and Iran and Russia on the other is an affront to the unarmed Syrian civilians who protested for a year without receiving a single bullet, medicine or dollar in aid from anyone. What is happening in Syria is not the brainchild of either Saudi Arabia or Qatar, but a genuine uprising against a hideous regime. It is an uprising involving the majority of the Syrian people against the Syrian regime and its backers -- an inborn revolt against the world’s most cruel regime, a regime unreceptive to conciliation or reform. 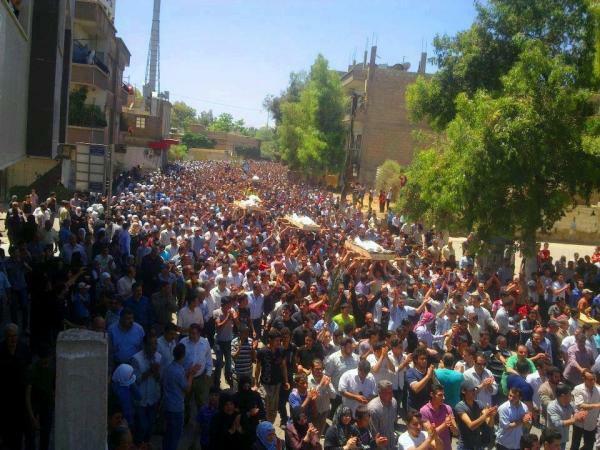 The Syrians are aware all the talk of elections and reforms is a pack of lies. They thus face two stark choices: a confrontation of many years or one of fewer years. But in the end, the regime won’t withstand the people’s hatred and their yearning to bring it down. If Kilo foresees the revolution evolving into a civil and then regional war leading to Syria’s fragmentation into mini-states, why should that be worse than keeping Assad at the helm in Syria? Thinking out loud, is Assad likely to stand down, allowing a peaceful transfer of power as happened in Yemen? The answer is: certainly not. Would the regime dismiss Assad and restructure from within as happened in Tunisia and Egypt? Again, the answer is: definitely not. Could Assad’s regime be forcibly brought down internally? Yes, by way of a mushrooming intifada overpowering the blockade after a year or two. Is there a chance of Syria splintering, along Alawite or Kurdish lines for example? Would that trigger a civil war? Going over the main points, would the Syrians desist and stay home for fear of the country’s partition or a civil war? Absolutely not, because remaining under Assad’s regime is worse than risking a state of war. If Kilo initially assumed uprooting the regime was going to be a walkover, he was wrong. He is equally wrong if he believes today that returning to live under Assad is like returning home after watching a film at the local cinema. So let’s focus on a solution that would evict the regime, not keep it – as peacefully as possible, or differently.